View of the Onion Creek salt diapir looking northwest. Note the tilted rock layers on the right. These deposits were folded upward as the salt penetrated through the Cutler Formation. What’s that smell? Located in southeastern Utah’s slickrock country is a unique geologic feature with a distinct smell of its own. Aptly named, the Onion Creek salt diapir is near the Fisher Towers Recreation Site northeast of the town of Moab (Fisher Towers GeoSight). Flowing through the diapir is Stinking Spring, a naturally occurring sulfur-rich spring. 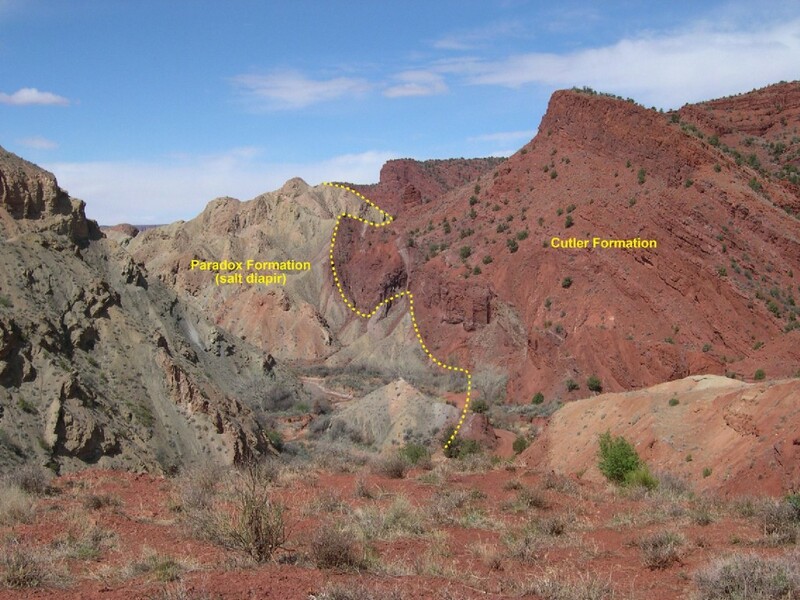 During the Pennsylvanian Period (about 300 million years ago), most of Utah was covered by an ancient sea. The Moab area was located in an enormous depression called the Paradox Basin. As sea levels fluctuated over millions of years, multiple cycles of flooding and evaporating occurred in the basin, leaving thousands of feet of salt behind. The resulting Paradox Formation is 65 to 85 percent salt and is interbedded with layers of gypsum and anhydrite. These salt beds eventually became buried by other rock layers. Because salt deposits are less dense than overlying rock deposits, they behave buoyantly and rise toward the surface. The salt squeezes upward and intrudes into the overlying rocks through zones of weakness such as fractures and faults. As the salt moves, it bends and penetrates the overlying rock. The intruding “salt bubbles” are called salt diapirs. So, what about that stinky smell? Sulfur is present in the area, which results in the smell. Where did the sulfur come from? Salt diapirs develop a cap rock of relatively insoluble anhydrite and gypsum (calcium-sulfate minerals) which accumulate as the result of leaching during the diapir’s rise toward the surface. The cap rock contains sulfate-reducing bacteria that produce sulfur and hydrogen-sulfide gas. Stinking Spring carries the foul-smelling sulfurous gas to the surface. In most environments, salt that reaches the surface weathers rapidly because salt is very soluble. The salt of the Onion Creek diapir is still exposed and visible, at least for now. However, probably only a small amount is visible compared to what has already been dissolved away. The Onion Creek diapir is about 2 miles long and 1 mile wide. The white-colored salt and gypsum beds of the diapir are in striking contrast with the surrounding red rocks of the Triassic Moenkopi Formation (approximately 245 million years old) and the reddish-brown sandstone, mudstone, and conglomerate of the Permian Cutler Formation (approximately 290 million years old). The diapir contains numerous small faults and folds that resulted from the salt movement. The rocks and terrain of the area record a long history of deposition, deformation, and geomorphic change related to movement of the Onion Creek diapir. Several pulses of salt flowed into the diapir between about 2–3 million and 250,000 years ago, and the diapir may still be active today. Nearby Fisher Creek once flowed along the present course of Onion Creek to the Colorado River. The rising salt diapir created a natural dam that resulted in the deposition of over 400 feet of basin-fill sediments in Fisher Valley. After the basin filled up, Fisher Creek established a new course to the Dolores River. Today, Onion Creek flows toward the Colorado River, through both the basin-fill sediments and the diapir. Eventually, continued headward erosion may allow Onion Creek to capture Fisher Creek, restoring the original drainage course. From Moab, travel approximately 2 miles northwest along U.S. 191 to the turnoff for Utah State Highway 128. Turn right (northeast) and travel approximately 20 miles to the turnoff at Onion Creek Road (just past Sorrel River Ranch Resort). Fisher Towers can be seen to the east at the turnoff. Turn right (east), leave the pavement, and proceed 5 to 6 miles to The Narrows and Stinking Spring. Continue 13 miles to Fisher Valley and the end of the graded road.